The objective of the training was to improve capacities of OWAS staff in designing good RLFs and improve the monitoring of results, as part of OWAS M&E strategy. This session proved to be valuable opportunity for the projects to expose the numerous doubts and problems they faced with regards to the designing of RLF for OWAS operations, and seek clarification from ORQR. The training was specifically tailored to OWAS requirements. The objective of the training was to improve capacities of participants to correctly apply the IPR methodology with respect to the assessment of performance of both the Development Objective (DO) and Implementation Progress (IP) ratings. This session proved to be valuable opportunity for the projects to expose the numerous doubts and problems they faced with regards to the application of the IPR rating methodology. Raise staff knowledge of Bank’s financing and non-financing instruments, for PSD and PSO. Increase staff understanding of PSD-related themes (e.g. Public Private Partnerships; Policy and regulatory reform issues; Financial sector development and intermediation models). Today, the whole world is very bullish about Africa: a decade ago, a respected magazine called Africa the hopeless continent; now even it is acknowledging that Africa is rising. Sub-Saharan Africa’s growth momentum has been maintained over the past two decades and the prognosis is good. Despite substantial progress in reforming the overall policy environment it would appear that many African countries may not achieve the Millennium Development Goals. This is partly attributable to their weak capacity in public and private sectors in Africa, which is acknowledged as a major impediment to the attainment of poverty reduction goals. It is therefore evident that no matter the amount of financial resources mobilised for Africa’s development, such funds will yield only limited or modest results if countries do not have the human, organisational and institutional capacity to absorb and effectively utilise them. The landscape for education, training and skill development in Africa has changed drastically over the last 50 years. Africa has made meaningful headway in expanding access to education and training although opinion is still divided over whether quality and relevance have kept pace with access. Despite the successes achieved, Africa still remains the continent with the lowest access to education and training compared to other regions. Today Africa is provided with tools in Information and Communications Technology (ICT) to leapfrog the traditional development trajectory by adopting appropriate technologies, relevant methodologies to develop and deliver content that meets the needs of the continent. The ICT revolution in Africa is rapidly increasing connectivity across the continent, which also benefits capacity development activities. Internet broadband penetration has risen rapidly, from a meagre 0.1% of the population in 2000 to an estimated 7% in 2010. By 2060, coverage is projected to rise dramatically to 99% of the African population. In addition, mobile technology has permeated all regions of the continent with Africa witnessing one of the fastest growing mobile subscriptions in the world. Recognising this trend, the African Development Bank’s recently approved Ten Year Strategy covering the period 2013-2022 recognises the significant leverage of relevant research and knowledge generated by regional and sub-regional institutions. 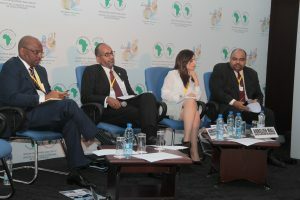 The core mandate of the African Development Bank is development financing but we have also recognised that our success in achieving the ultimate objective of poverty reduction and sustainable development in Africa depends critically on the depth and wealth of our knowledge of the development challenges facing the Continent and individual African Regional Member Country (RMC). To meet our operational objectives and to help create a knowledge-based environment in Africa, the African Development Bank has embarked on an eLearning Initiative to expand the width, breadth and relevance of its capacity development activities. We believe that the implementation of an effective eLearning platform, access and content would directly make training more available to a wider audience. The eInstitute Portal is a virtual knowledge and learning space for knowledge brokerage. The portal is created to manage the Bank’s outreach through distance and eLearning and to build a culture of continuous learning through a community of practice and regular knowledge exchange. The capacity development landscape is slowly changing. Technologies are advancing in Africa, the Bank is continually working with other stakeholders in the industry in Africa and beyond and people are embracing new approaches to training and learning. All that is needed is a more harmonised approach to getting people, technologies and content together to achieve a new level of capacity development.